Simpson University has entered into an agreement with the Department of Veterans Affairs to contribute to the Yellow Ribbon Program and has agreed to provide Yellow Ribbon Program contributions to up to one hundred eligible individuals per program each academic year. "After investigating several options, I decided that Simpson's ASPIRE program was by far the best program for my busy lifestyle. Being a father of four and having a career that requires so much of my time, a 9-to-5-type school setting was not suitable. ASPIRE is exactly what I needed to maintain my priorities and finish my degree. I decided to major in psychology because everything I teach in my role as a survival instructor revolves around understanding the physiological and psychological effects of human behavior. After Sept. 11, 2001, I joined the Air Force and became an in-flight refueler on the KC-10 aircraft. As part of my service, I received Survival Evasion Resistance and Escape (SERE) training. After leaving the military, I worked with the U.S. Secret Service, Army Rangers and Special Forces, Marine Corps Special Operators and Navy SEALS in teaching survival techniques. Now I teach survival skills to individuals and families without a military background, through an organization I founded called Project Taken. My goal is to increase the awareness and education level of young people and families both traveling abroad and carrying out their day-to-day activities here at home to help them identify and survive physical threats. 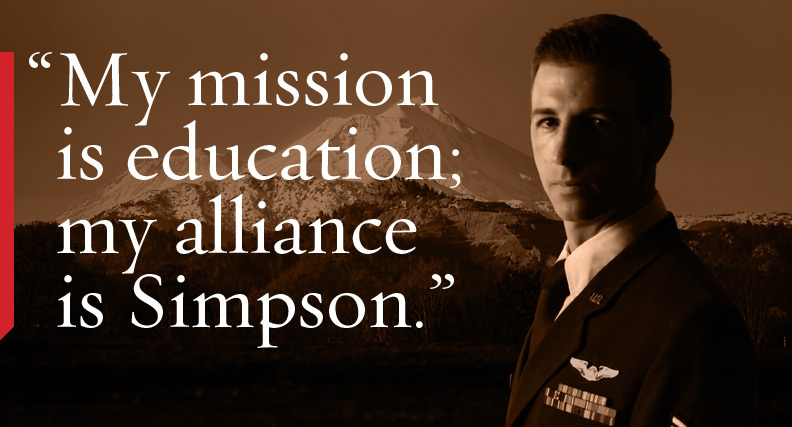 My goal with my Simpson degree is to apply the things I've learned to the courses I teach, so that my students always receive an advanced level of training. If there is one thing I took away from being in the military, it's that learning only ends when you decide it does. I chose Simpson University because it produces the best results. The staff and professors here have met my needs and surpassed my expectations hands down."